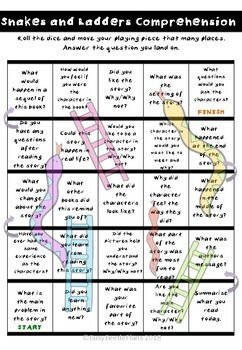 This resource includes two snakes and ladders game boards with comprehension questions that can be used in class activities to improve the comprehension level of your students. Print and laminate the game boards. Set up on a table with counters or other playing pieces for each student playing and a die for each game board. 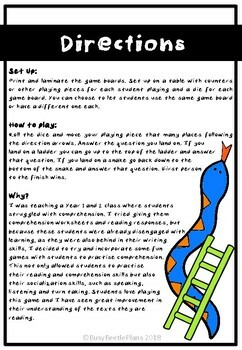 You can choose to let students use the same game board or have a different one each. Roll the dice and move your playing piece that many places following the direction arrows. Answer the question you land on. If you land on a ladder you can go up to the top of the ladder and answer that question. If you land on a snake go back down to the bottom of the snake and answer that question. First person to the finish wins. I was teaching a Year 1 and 2 class where students struggled with comprehension. I tried giving them comprehension worksheets and reading responses, but because these students were already disengaged with learning, as they were also behind in their writing skills, I decided to try and incorporate some fun games with students to practise comprehension. This not only allowed students to practise their reading and comprehension skills but also their socialization skills, such as speaking, listening and turn taking. 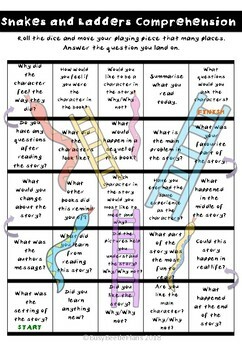 Students love playing this game and I have seen great improvement in their understanding of the texts they are reading. Thumbnails show exactly what is included in resource! 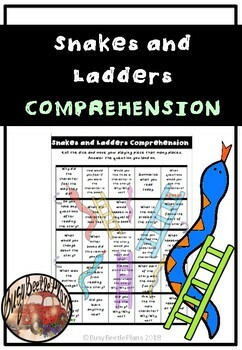 Looking for more comprehension games?